Polenta that is made in the usual way, following the master recipe, but about halfway through cooking, you add Savoy cabbage that has been shredded and sweated in butter with some finely sliced onion until quite soft. Then, just a few minutes before serving, you stir in some boiled beans (preferably borlotti, but I used some cannellini that I had on hand). It is one of my favorite of the ‘flavored’ polentas. This polenta is so flavorful that it needs no sauce. When using leftover polenta to make polenta pasticciata con fagioli e verza, you place a layer of polenta at the bottom of a buttered baking dish, then top it with a generous layer of béchamel sprinkled with a bit of grated parmesan cheese. Repeat until you’ve used up your ingredients and end with a nice layer of béchamel topped with a generous sprinkling of grated parmesan cheese. Bake in a hot oven (200C, 400F) for about 15-20 minutes, until the top is nicely browned and the sauce and cheese are bubbling merrily along. Let the polenta pasticciata rest a few minutes to cool off and ‘settle’ before serving. I rather like making this polenta pasticciata in individual terracotta bowls, of the kind that you eat minestrone or French onion soup in. If you do, placing all the bowls on cookie sheet, so they can all be put in and taken out of the oven at one time, will save you some time and trouble. It also makes for a lovely presentation, as each diner gets to dig into their crusty polenta themselves. If you like, use another kind of cheese, such as a fontina or a gruyère, instead of or in addition to the parmesan. There are many types of polenta pasticciata: Perhaps the most popular is to layer your polenta is like lasagna alla bolognese, with alternating layers of béchamel and ragù. But there are other ways to make polenta pasticciata, alla lombara, for example: layered with fontina cheese and topped with lots of melted cheese before baking in a hot oven until golden brown or alla tirolese—Tyrolean baked polenta—layered with anchovy butter. 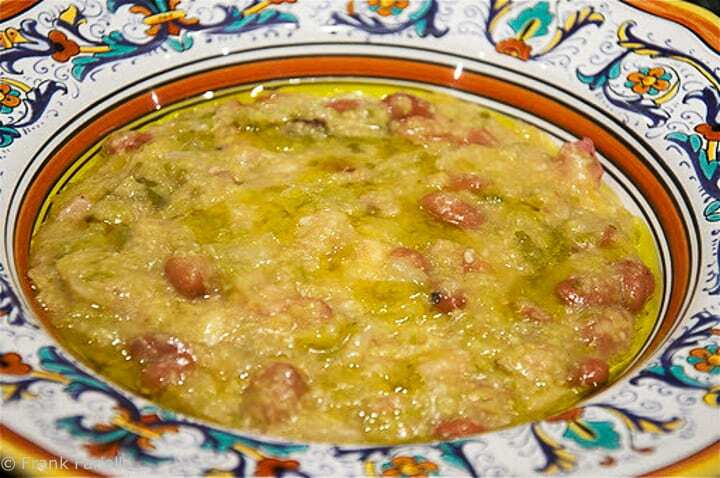 There are also many types of flavored polentas, including a Tuscan one, very similar to this one, called polenta con fagioli e cavolo nero, made with beans and ‘black kale’, usually called Tuscan kale in English. Tuscan kale is a typically Tuscan green that is used in countless soups and other dishes. I have occasionally found it in farmer’s markets and even, once or twice, in my local supermarket. Its leaves are rather flatter and longer, and more tender, than the curly kale you are likely to find elsewhere. But I digress… we have another month or two of cold weather, and many polenta dishes to blog about! Polenta that is made in the usual way, following the master recipe, but about halfway through cooking, you add Savoy cabbage that has been shredded and sweated in butter with some finely sliced onion until quite soft. Then, just a few minutes before serving, you stir in some boiled beans (preferably borlotti, but I used some cannellini that I had on hand). It is one of my favorite of the 'flavored' polentas. This polenta is so flavorful that it needs no sauce. When using leftover polenta to make polenta pasticciata con fagioli e verza, you place a layer of polenta at the bottom of a buttered baking dish, then top it with a generous layer of béchamel sprinkled with a bit of grated parmesan cheese. Repeat until you've used up your ingredients and end with a nice layer of béchamel topped with a generous sprinkling of grated parmesan cheese. Bake in a hot oven (200C, 400F) for about 15-20 minutes, until the top is nicely browned and the sauce and cheese are bubbling merrily along. Let the polenta pasticciata rest a few minutes to cool off and 'settle' before serving. F***tacular. Thanks for the recipe. I love simple dishes like this. Thanks, all you polenta fans! Such a versatile food… and wild boar (cinghiale) is wonderful. I miss it, not much call for it here! I do something similar and serve it as a side dish with meat. In fact…. may do so today…. I just love reading your descriptions. I am really adoring polenta lately, and liked hearing about all the leftover options! So far my favorite is serving soft polenta with wild boar ragu…. mmmmmmm. I have been making this dish of mine since then. But it looks like a whole new dish because of the twists. What a fantastic way of using leftover polenta! Another great recipe. Yum! I love the recipe with cabbage and beans! I also have a recipe of polenta layered with a mushroom sauce. Yum! I am SO excited to have another way to enjoy polenta, thank you!!! This is another favorite dish of ours. First time i've seen it in english, though! Thanks!